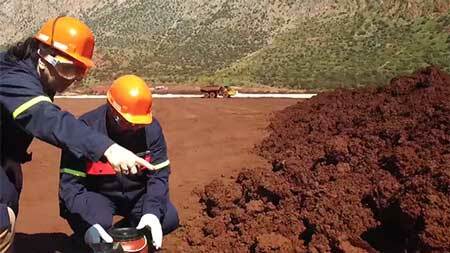 (Nanowerk News) For every ton of alumina, the Aluminium of Greece plant in Agios Nikolaos – near the large bauxite deposits at Boeotia and Phocis – produces a ton of bauxite residue, making around 2,000 tons of the heavy red mud every day. What is needed is a cheap and clean way to extract these coveted elements. It’s one of many goals of a European research project that looks to alleviate Europe’s total dependence on imported rare earths. Engineers in Athens have developed a simple method to dissolve and remove rare earth elements from red mud (SCALE project). The key is using an ionic liquid rather than more traditional solvents. Iconic liquids are molten salts that can stay liquid at room temperature. PhD student at NTUA School of Mining and Metallurgical Engineering Panagiotis Davris told Euronews how the process works.